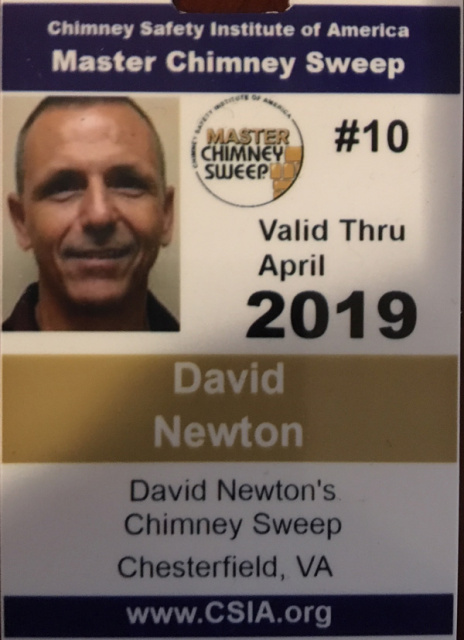 D avid Newton Chimney Sweeps offers chimney cleaning, inspection and repair services in Richmond, Virginia and surrounding areas including Hopewell, Prince George, Powhatan, Chesterfield, Colonial Heights and Petersburg. EXPERIENCE. We have over 30 years experience sweeping and repairing chimneys in this area. LICENSED. We carry a current contractor’s license covering the scope of services we offer. PERSONAL SERVICE. I’m there on every job, assuring you’re getting the very highest quality of service and care possible. In these days of mass-produced products and companies with fleets of trucks where you might never see the same guy twice, isn’t it nice to know that you’re getting personalized service from the owner?